YouTube quality reports evaluate video streaming from Internet service providers. A Google video quality report for New York City. Content providers have been getting increasingly annoyed with Internet service providers lately. For example, despite paying Comcast to ensure a better and faster experience for video-streaming users, Netflix CEO Reed Hastings very publicly disagrees with the power ISPs currently wield. And YouTube isn’t happy, either. 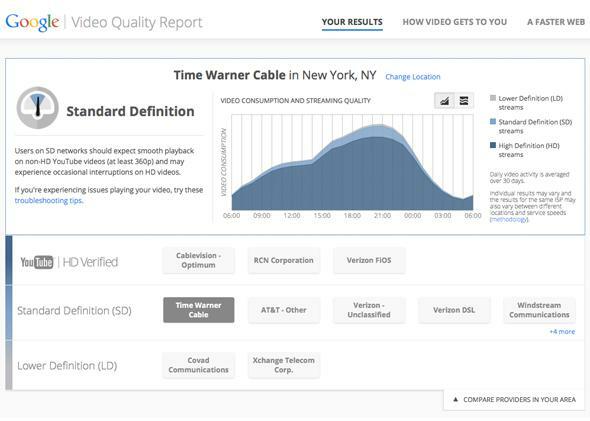 So Google has started issuing Video Quality Reports to try to encourage ISP accountability. In a blog post, YouTube explained that some ISPs allow users to watch only standard definition 360p videos. If customers want to watch HD YouTube videos, they have to wait for buffering. But other ISPs stream HD videos through right away. In its Video Quality Reports, YouTube is going to “HD Verify” ISPs that automatically show HD video to their users in almost all cases. TechCrunch reports that to meet this standard, Google estimates ISPs must be providing 2.5 Mbps of throughput. There isn’t a lot of recourse for consumers right now except switching providers if their current one rates poorly. The Video Quality Reports offer comparisons and local data about how many people in a town or city are watching YouTube videos in HD and regular definition. But knowledge is power! Check how your area is faring, and if you don’t like your ISP, let it know and then find a new one. If you can.